Stepping off the train in Amsterdam and meandering into the city centre, it quickly becomes apparent what a blue city Amsterdam is – you can’t miss the canals, but you can get lost in them. Walk (or bike) a bit further though, and Amsterdam’s green side also shows. Ivy and various flowers climb old brick buildings, and the Dutch love converting any patch of brown into a designated (and stereotypical) miniature tulip garden. Every canal bridge contains perfectly manicured planter boxes carefully changed with the season, and many residents – balcony or not – proudly display their own window box varieties. This city is a photographer’s dream, and after 4 years , I still keep my camera at the ready. 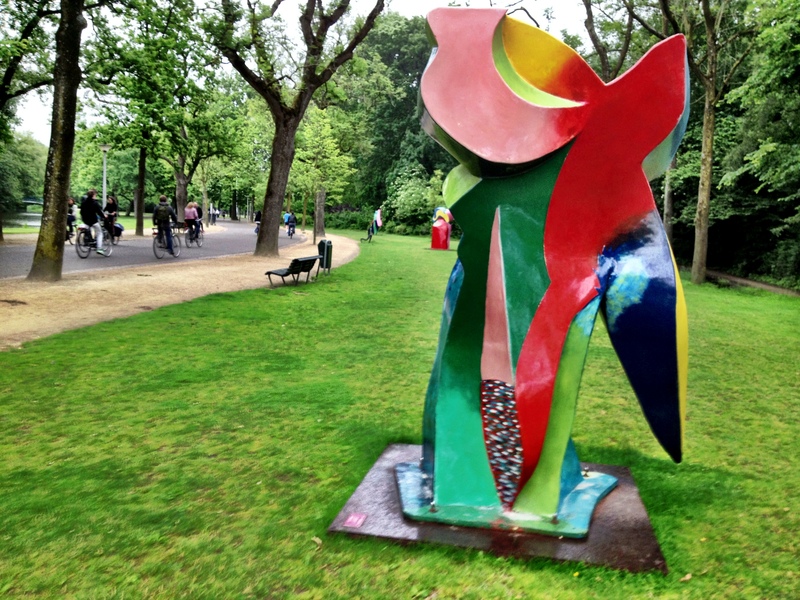 In addition to these quick green glances, Amsterdam has a great network of parks – 30 in fact. They are large and small, quiet neighbourhood varieties or popular spots for festivals, picnics or exploring. Most have bike paths (it’s Holland after all) and they carefully dot the city adding a green corridor appreciated by all of Amsterdam’s residents – humans and nonhumans alike. Amsterdam’s most famous park, Vondelpark, is conveniently located on my bike route into the city centre, meaning that I get to experience this park as it changes with the seasons or the celebrations. 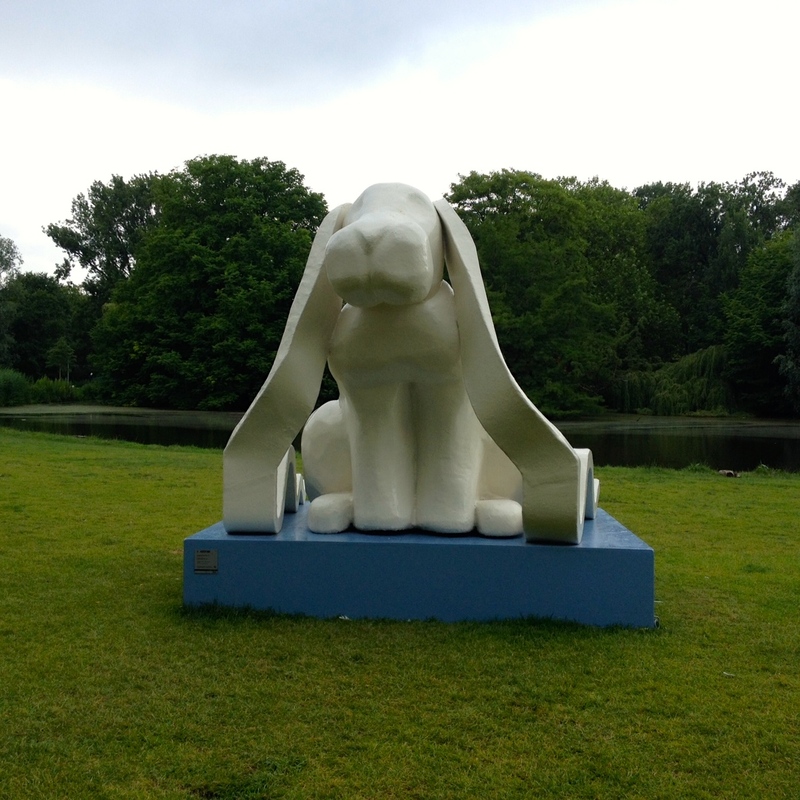 This year Vondelpark celebrates 150 years, and an interesting journey it has been. It began as a project commissioned and funded by Amsterdam’s elite; even today, some of Amsterdam’s nicest homes and neighbourhoods are located in its periphery. 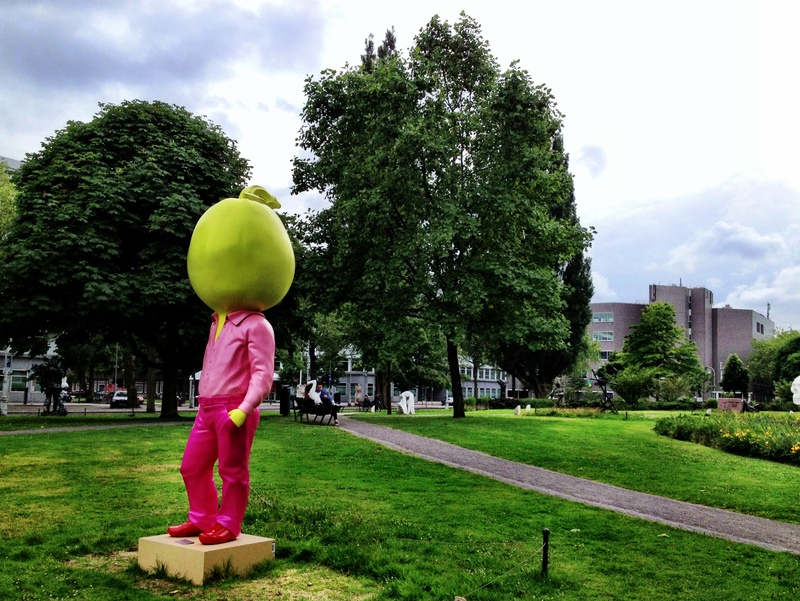 Today, Vondelpark has become the people’s park. 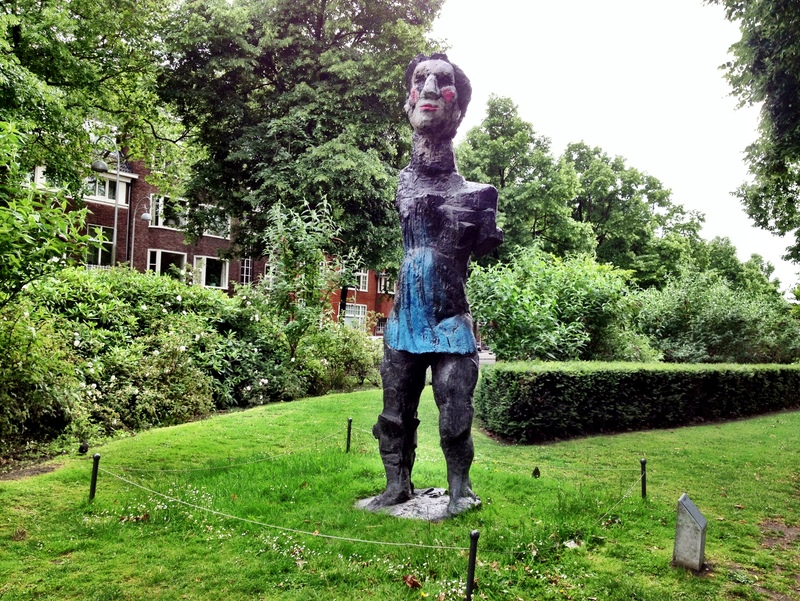 On any given day – albeit sunny spring or summer days are best – the park is full of all walks of Amsterdam life. Families celebrate children’ birthdays adjacent to bongo-playing pot smokers; rap musicians and hipster guitarists compete for attention. This musical blend seems to work – well, from what I take in as I cycle by. Meanwhile, one can always catch a casual frisby match or rollerblade competition. It’s also a popular venue for Amsterdam expats to celebrate their national traditions – a Swedish midsommarstång, an American Independence Day picnic or World Cup parties. 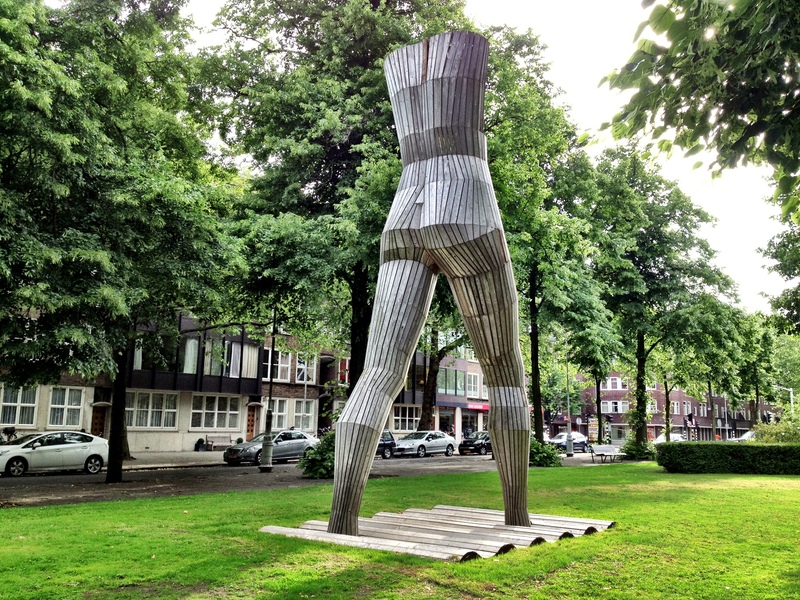 To celebrate its sesquicentennial, this summer Vondelpark is home to the Art Zuid Junior exposition (on display from 15 June- 24 August) with some 20 artworks from young Dutch artists. Art Zuid Junior builds on the Art Zuid concept, launched in 2009 and repeated every two years. Art Zuid is an international public art expo with life-size (or larger) art installations displayed throughout Amsterdam Oud Zuid (the Old South) in order to commemorate the planning genius of architect H.P. Berlage, who was responsible for Amsterdam’s southern urban expansion of 1917, called Plan-Zuid. His master plan included large expanses of public spaces, park planning and green boulevards. 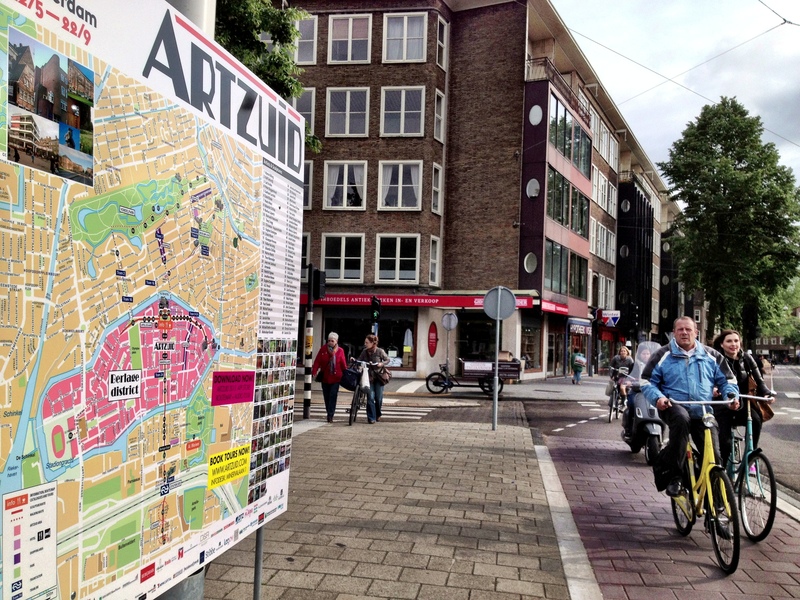 Art Zuid attempts to encourage Amsterdamers from across the city to explore and appreciate these less frequented spaces found in the city’s different neigbourhoods. It stretches from Museum Square (home of the Rijksmuseum and Van Gogh Museum) through Vondelpark and to the numerous boulevards that speckle Oud Zuid. 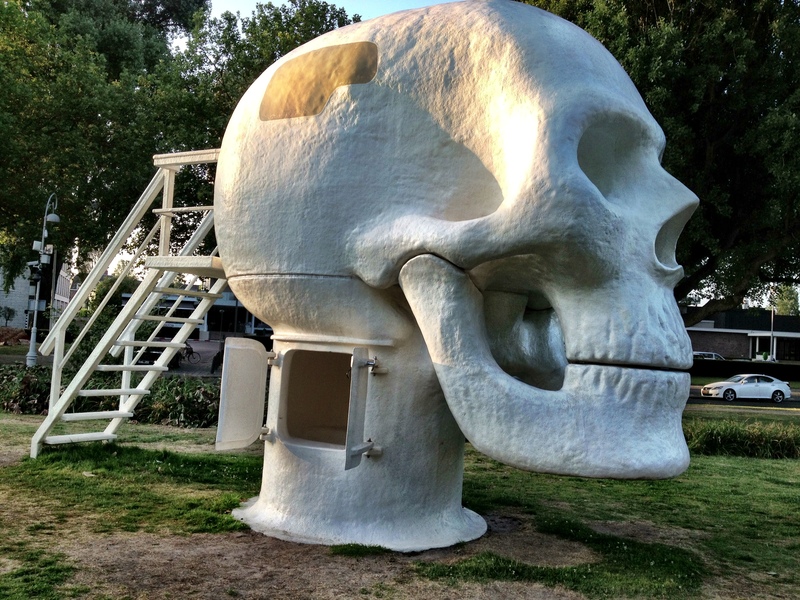 It’s a great expo, well appreciated by locals and visitors alike who casually stroll along the sculptures and statues, perusing the artist information or climbing some of the more interactive art works. 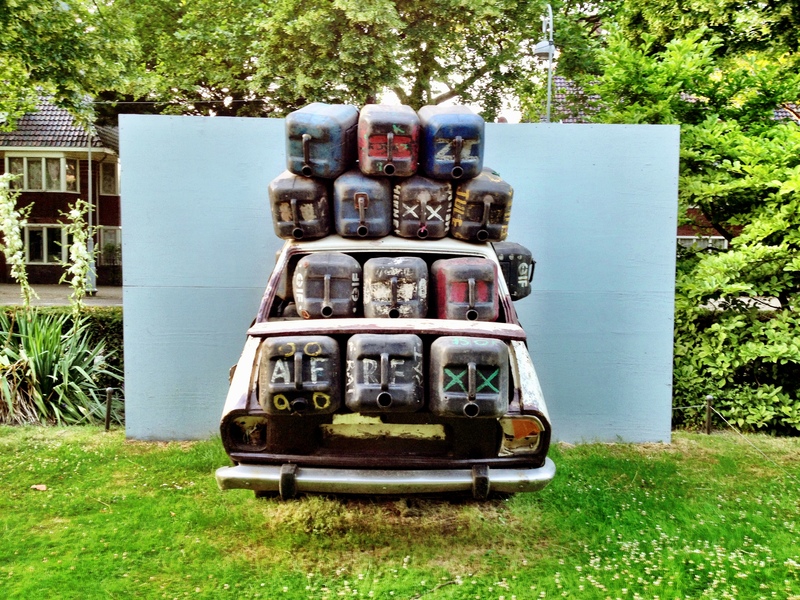 This year though: be sure to check out Art Zuid Junior. 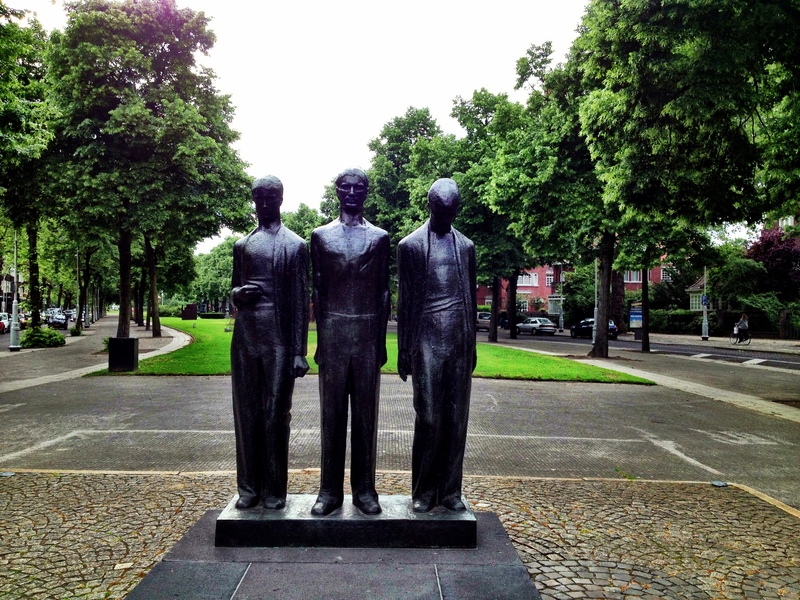 My favorite sculpture? 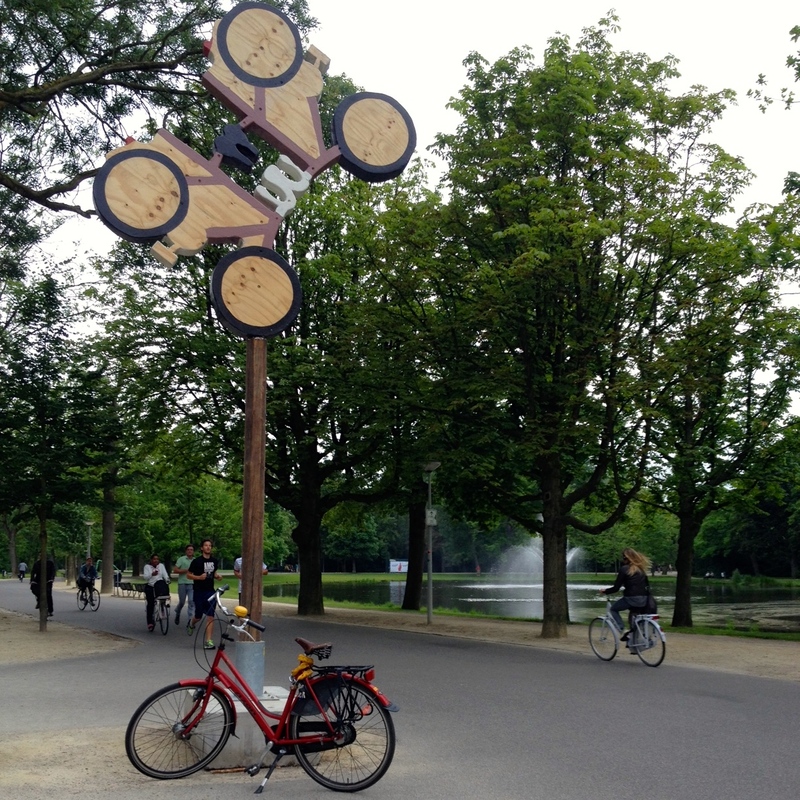 The bicycle art! 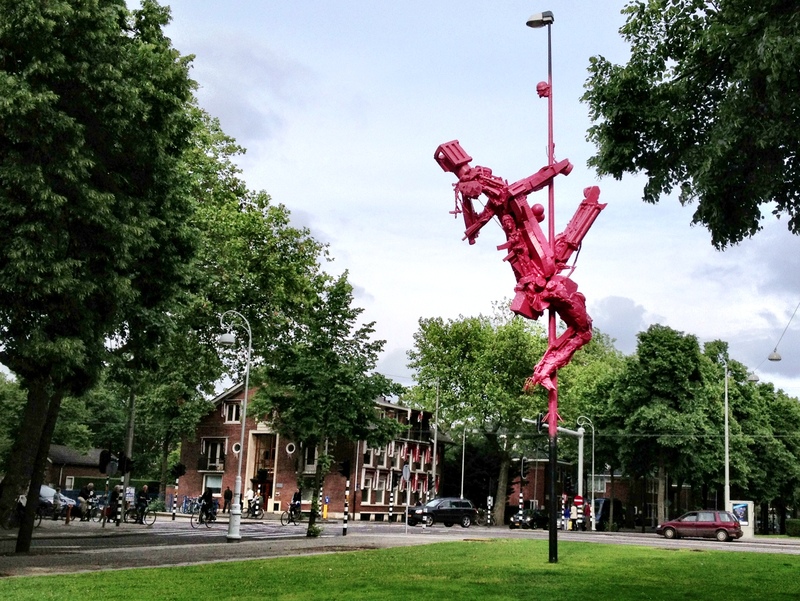 Below are selected images from Art Zuid 2013. Hi Jennifer! I think you wil like this. Its a website i started a few months ago. Its guided tours in museums : http://www.amsterdam-museumguide.com We offer two hour tours in small groups and we have great ratigs… If you are interested in posting something about us we can talk about a collaboration or something like that.. And you are welcome to join one of our tours too ! Hi Caspar, sounds interesting. 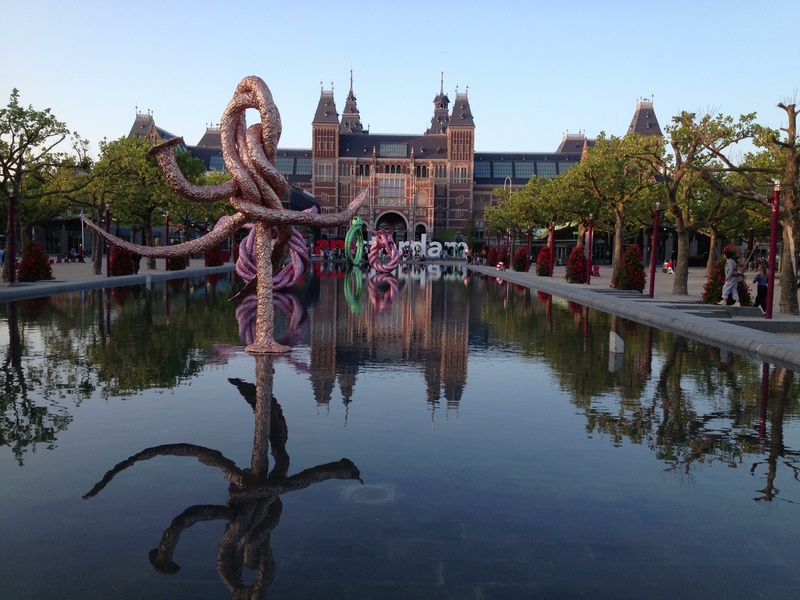 I love Amsterdam’s museums – and certainly a museum card holder. 🙂 I’m away for a week or so, but let’s speak afterwards. Thanks for getting in contact.